Scott woke up at 7:00 am to open his presents. Susan told him that she'd get up after Scott was able to get Matt out of bed, fully expecting that she'd be able to doze until some time in the early afternoon. To our shock, Scott and Matt came down the stairs a little after 8:00 am! 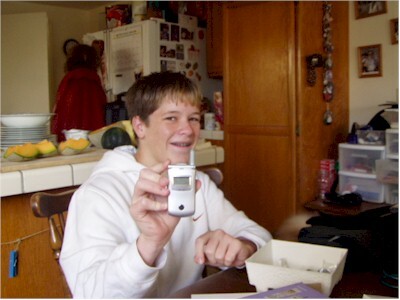 Scott got some nice clothes, a basketball, a couple of games for his Play Station, and this phone. As I had done for Matt a year or so agoI forced him to learn how to enter things into his phone book by entering our other cell phone numbers under the names of "Mommy", "Daddy", and "Big Brother Matty", with an obnoxious ring-tone for each of us. Needless to say, he's now able to enter and edit names and numbers on his own.